Every morning, my husband and I pack our children off to school carrying homemade, "waste-free" lunches in fun, reusable containers. By choosing to forgo packaged or cafeteria foods, we teach our children healthy eating habits and minimize the garbage that ends up at landfills or recycling plants. As if that weren’t reason enough, waste-free lunches also save us money. It’s simple but meaningful—and oh-so-easy! Childhood obesity is at an all-time high in North America. If you read the labels on many of the most common lunchbox items, a picture of why starts to crystallize. At their best, pre-packaged foods are high in sugar and low in nutritional value; at their worst, they’re void of nutritional value and completely on par with candy-store sweets. But it’s not just our children’s bodies we’re polluting with pre-packaged lunch foods. According to Amy Hemmert, co-founder of Laptop Lunches (see bento box pictured above), the typical child generates about 65 pounds of discarded school lunch packaging each year. That equates to 18,000 pounds for an average elementary school yearly or, more alarmingly, over 1 billion pounds of waste in the U.S. annually. We can do better. Our kids are counting on us to do better, for their health and for the health of the planet they will inherit. Packing waste-free lunches doesn’t need to be intimidating. So why is it? Well, like anything there is a learning curve. It takes a little trial and error to get into a groove, but once you do, waste-free lunches are as simple to pack as their carbon-heavy counterparts. Ditch the plastic tubes of yogurt in favor of healthier (and cheaper) pints of whole plain yogurt. In a small container, mix your favorite fresh (or frozen) fruit with yogurt and honey. If kids have a real propensity for sweetness, jam could be used instead of fruit and honey. Those little aluminum wrappers add up. Imagine that every school-aged child in North American has a granola bar in their lunch every day. That’s a lot of wrappers making their way into the landfills. Instead, try this granola bar recipe! Dried fruits like papaya, apricot, banana, apples, and mango make delicious waste-free alternatives to their packaged counterparts. Bought in bulk and stored in the pantry, they make it simple to create a variety of sweet treats for lunches throughout the week. Sure, the little plastic cups are convenient, but real one-ingredient applesauce is tastier, healthier, and waste-free. It can be purchased in glass jars, or, for true savings and enviro-goodness, try your hand at a homemade version. It’s as easy as steaming cut, peeled apples and pureeing them. For variety, add berries, plums, or peaches to batches. All of these store easily in the freezer for use throughout the year. The sandwich is a lunchbox staple, and while creative alternatives—like tacos, mini pizzas, and shish-k-bobs—make for nice variety, most busy families will turn to the basics at least some of the time. Unfortunately, most sandwich meats are highly processed, heavily packaged, and shipped from afar. Add to that the zipper-seal bag they tend to be packed in, and it’s a veritable plastic party. Cut through this cycle by incorporating dinner meats into lunchtime sandwiches and then packing them in a reusable box or wrap (see here for examples, or make your own). A weekend roast chicken can make great sandwiches later in the week, and leftovers are easily sliced and frozen for subsequent lunch packing. One of the most common fears expressed by parents is that their kids will stage a full-scale rebellion in support of squishy, bright-colored, fruit-shaped snacks and packaged cheese that strings. This could be true. But rare is the child who doesn’t care about Planet Earth. Children’s innate empathy is boundless. And when we parents, in our role as educators and authority figures, rationally explain to our sugar-twitching children than some of the choices we’ve been making are hurting our planet, they quickly come on board. Maintaining their continued support can, admittedly, be a challenge. The key is to make their waste-free lunch “cooler” than anybody else’s lunch. This requires a little creativity and a few supplies. Mini cookie cutters, for example, transform vegetables into a kid-pleasing selection of shapes and sizes. Hard-boiled eggs can be molded into a heart shape. And pancake sandwiches are begging to be decorated with happy faces, keen to greet your child with a smile at lunch! When time and energy are limited, a reusable decorative skewer can be the difference between ordinary and special. Community goes a long way. The child munching on a homemade cookie in a sea of poptarts may well feel a pull that has more to do with belonging than food. Engaging your child’s class or school in a commitment to reducing waste will help your child feel like part of a bigger movement, and will go a long way toward deepening his or her environmental commitment. Or at least, it should make it harder for them to trade your hard work for an individually packaged rice-krispie square. Similarly, kids might balk at the idea of bringing home their food scraps for the compost, but they will take joy in participating in a school-based compost program, where the values of responsible stewardship and sustainability are normalized through collective action. If your child’s school doesn’t have one, ask why not? Helping your child feel part of something bigger increases their buy-in to the waste-free lunch commitment. So does the perfect lunch box. Every kid covets a super-cool lunch box. Every parent wants a super-easy lunch option. Luckily, an appealing array of socially responsible, non-toxic, waste-free lunch box makers have popped up over the last few years, making waste-free packing both cool and simple. 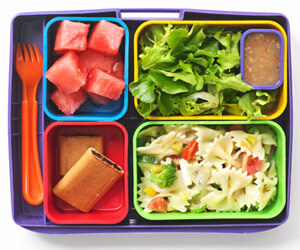 From the melamine, dishwasher-safe Goodbyn, which comes with stickers for your child to personalize it, to PlanetBox’s sleek stainless-steel box with creative cases, to LunchBots’ compartmentalized carriers that are perfectly sized for preschool appetites, the right lunch box is out there for each and every kid. The price tag on these enticing lunch systems reflects their value; but fear not—the long-term savings associated with waste-free lunches more than offsets the initial cost. By our estimate, our family has saved approximately $400 over three years. With little sister joining the school-aged masses this year, we’re looking forward to doubling that in years to come. Silicone muffin liners: Bright-colored and dishwasher safe, these are the perfect fit for adding a little extra diversion when needed. Stainless-steel water bottle: Skip out on the juice and fill it with water. Name labels: Labeling ensures that your child’s newly minted and much loved waste-free lunch stuff makes it home again! One eco-conscious source for fun, durable labels is mom-owned Kidecals. A Thermos bottle: At our house, this is where the kid favorites, like storybook characters and fairies, make their daily appearance. Once you’re in the swing of your new lunch-packing routine, you’ll revel in the simplicity of healthy, waste-free, lunch prep. With a little time, energy, and commitment—probably less of each than you put into organizing your child’s after-school activities—you’ll divert nearly 70 pounds of waste from the landfill and sow the seeds of sustainability in your child’s consciousness, and perhaps even in your community. All of this, while saving money and eating better. Why not? Tovah Paglaro lives in Vancouver, Canada, and is the editor of Thrifty & Green Family. She is also the author of the Thrifty & Green original series Growing Up Green, where she writes about her family's adventures raising three kids with sustainable values and practices. Follow her on Twitter (@tovahp) and connect with her on Thrifty & Green’s Facebook page. And for the next year, Tovah is anointed the David Suzuki Queen of Green. Keep up with her green living articles here.